The Penn State Hershey Clinical Simulation Center includes three departments: the Simulation Center, the Resuscitation Sciences Training Center (RSTC), and the Standardized Patient Program. Each of these departments utilizes simulation as a teaching methodology for many types of learners. These departments provide learning opportunities for practicing physicians, residents physicians, nurses, respiratory therapists, paramedics, pharmacists, and other health professions, as well as students in medicine, nursing, and physician assistants schools. 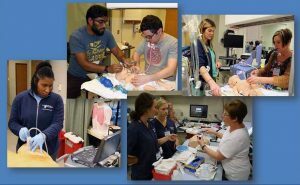 Jointly operated and funded by the Milton S. Hershey Medical Center and the Penn State University College of Medicine, The Clinical Simulation Center has a long history of success in simulation-based education and research. Mission: The mission of the Penn State Hershey Clinical Simulation Center is to improve patient outcomes with effective programs that promote and enhance practitioner skills, clinical competence, teamwork, and interdisciplinary collaboration. To advance the field of healthcare simulation, the Center conducts innovative research into simulation theory, practice, and technology.